Voigt on the velodrome in Switzerland. 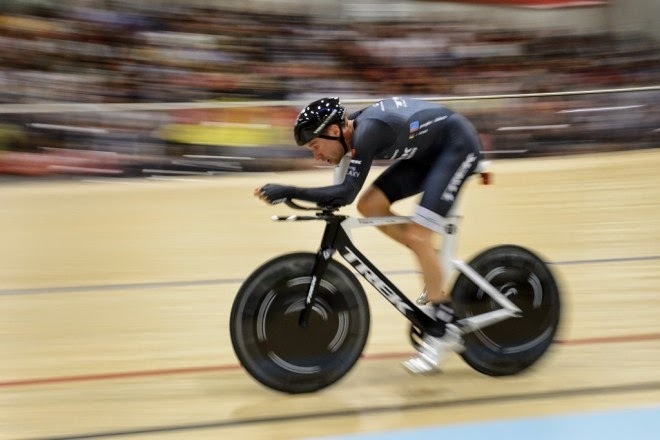 The prestigious Hour Record was smashed by 43-year-old Jens Voigt with a record distance of 51.115 km. Voigt averaged just under 32 mph for the record setting ride. The previous record was set in 2005 by a rider from the Czech Republic, Ondrej Sosenka, with a distance under 50 km. The Hour Record is always attempted indoors on a velodrome. The Union Cycliste Internationale (UCI) is the governing body that oversees the rules and the records. The equipment rules have changed some through the years, but the race against the clock remains the same. Voigt rode a custom Trek time-trial bike with disc wheels and 55-14 gearing. The seating position and handlebar arrangement were conventional time-trial style. The record was set September 18, 2014 in Grenchen, Switzerland. Past Hour Record holders include Eddy Merckx, Francesco Moser, Chris Boardman, Miguel Indurain, and Tony Rominger. Voigt said: “Now I’m on the list- nobody is going to strike me off it. To be up there with the likes of Merckx, Boardman, Indurain, I’m now proud that my name is with them”. Jens Voigt is a Trek Factory Rider with 17 Tour de France starts. The Hour Record marks the end of Voigt’s long career.